Pollution at Kaptai Lake is taking a serious turn due to open defecation by the slum dwellers and unabated dumping of garbage and wastes everyday, causing waterborne diseases like diarrhoea, dysentery and jaundice. 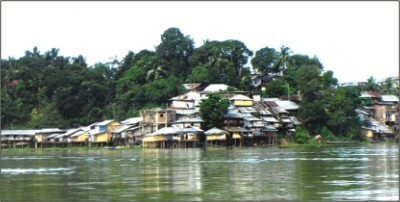 The people in Rangamati and Kaptai may face disasters if water pollution and crisis of safe drinking water continue. It also may cause environmental disaster any time, environmentalists said. Dumping of wastes, open defecation by the slum dwellers and the passengers of water transports are the prime causes of pollution at Kaptai Lake, sources said. They said several lakh people living in the lake areas in Rangamati and Kaptai are facing the problem as they use water of the lake in daily household and other purposes. Many of the families, including indigenous people, used to drink lake water directly. Rangamati unit of National NGO Forum, working on safe water and sanitation in the Chittagong Hill Tracts (CHT), also found very alarming result during its survey and test on lake water. Its officials have collected water from the most polluted areas of the lake. Total Coli Form (TCF) and Facile Form (RCF) were 800 and 300 respectively in per 100 millilitres in the Rajbari area, 500 TCF and 350 FCF at Banarupa while 600 TCF and 450 FCF in the Reserve Bazar area, according to the test. TCF and FCF level should be zero in water, said Alak Bikash Dewan, an official of the NGO Forum. Md Anwar Hossain, environmentalist and secretary of Rangamati Environment Conservation and Development Organisation (RECDO), said immediate step is needed to save the lake from pollution. Otherwise, it may cause disastrous situation in future. He said due to the pollution, waterborne diseases are spreading fast as many depend on the lake water for their bathing and drinking. Following this, number of patients with waterborne diseases at the Rangamati General Hospital was also increasing, district Civil Surgeon (CS) office sources said.